The handles are made from Antimagnetic Steel and Tips from Synthetic Fiber. Temperature Resistance: 375°F (190°C). Very hard, high tensile and flexural strength. High heat (260 to 300°C) resistance to thermal aging. ESD safe – low surface resistivity (102 Ohm). Heat stable (-40°C to 190°C). Rigidity, excellent tensile strength and flexural strength. Good chemical resistance (oils, greases, fuels, non-polar solvents); not resistant to strong acids, alkalis and hot water or steam. ESD safe, (avoids dust attraction, sparks, ignition sources). High tensile and flexural strength. Good chemical resistance and low moisture absorption. 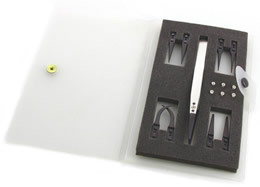 Specially designed for the electronics industry, these tweezers feature durable and self-aligning replacement tips, anti-magnetic stainless steel handles and are available with a variety of tip geometries and materials: they offer a significant cost savings. Excellent for handling sensitive electronic components, and ceramic and glass parts where non-metallic non-scratching is critical. Carbon fiber - tips: straight, strong, thick. OAL: 130mm, 5", ESD safe, Strong tips. Carbon fiber - tips: straight, narrow, flat, round. OAL: 130mm, 5", ESD safe, Flat round small tips. Carbon PEEK - tips: straight, narrow, flat, round. OAL: 130mm, 5", ESD safe, Flat round small tips. PVDF - tips: straight, narrow, flat, round. OAL: 130mm, 5", ESD safe, Flat round small tips. Carbon fiber - tips: thin, angled head. OAL: 125mm. ESD safe, Fine bent tips. Carbon PEEK - tips: straight, strong, thick. OAL: 130mm, 5", ESD safe, Strong tips. Carbon fiber - tips: straight, strong, pointed. OAL: 130mm. ESD safe, Fine tips. PVDF - tips: straight, strong, pointed. OAL: 130mm. ESD safe, Fine tips. Carbon fiber - tips: straight, flat, round. OAL: 130mm. ESD safe, Flat round tips. PVDF - tips: straight, flat, round. OAL: 130mm. ESD safe, Flat round tips. Carbon fiber - Reverse action - tips: straight, flat, round. OAL: 125mm. ESD safe, Flat round tips. Reverse action. Carbon PEEK - Reverse action - tips: straight, flat, round. OAL: 125mm. ESD safe, Flat round tips. Reverse action. Carbon PVDF - Reverse action - tips: straight, flat, round. OAL: 125mm. ESD safe, Flat round tips. Reverse action. Carbon fiber - Reverse action - tips: straight, very fine. OAL: 125mm. ESD safe, Very fine tips. Reverse action. PVDF - tips: handling 2", top fingers, stepped bottom paddle. OAL: 130mm. ESD safe, Plastic replaceable tip tweezers for 2 inches wafer. PVDF - tips: handling 4", top fingers, stepped bottom paddle. OAL: 130mm. ESD safe, Plastic replaceable tipÂ tweezers for 4 inches wafer. Carbon fiber - tips: straight, sharp, pointed. OAL: 115mm. ESD safe, Fine tips. Carbon fiber - tips: straight, sharp, pointed. OAL: 130mm. ESD safe, Fine tips. Carbon fiber - tips: straight, very fine. OAL: 130mm. ESD safe, Very fine tips. PVDF - tips: straight, very fine. OAL: 130mm. ESD safe, Very fine tips. Carbon fiber - tips: curved, very fine. OAL: 130mm. ESD safe, Very fine, curved tips. PVDF - tips: curved, very fine. OAL: 130mm. ESD safe, Very fine, curved tips. Replacement tips and screws for Plastic Replaceable Tip Tweezers. 5 tips, one tweezer- Carbon Fiber, includes styles: 249CFR.SA, A7CF, A5CF, A259CF, A2ACF. Encased in a top quality hard/foam wallet. These fiber tweezers are made from SV plastic which is based on polyvinylidene fluoride (PVDF). Good mechanical strength and toughness. Continuous use temperature up to 150°C. High purity (clean room and medical devices approved, low extraction value). Excellent chemical resistance to most aggressive substances. Outstanding resistance to HF, HNO3, HCl (all concentrations. 90°C). Resistant to UV and radiation (sterilization). ESD safe, very low surface resistively. Typical applications include the handling of very soft and contamination sensitive materials as well as the handling of wafers during chemical processes etc. The EMS carbon fiber soft tip tweezers feature scratch resistant carbon fiber tips, specially designed to handle sensitive objects. The body is made from low carbon austenitic, non-magnetic stainless steel. The tips are corrosion resistant to moderately aggressive chemicals, salts and acids. Optimal working temperatures are up to 350°C (662°F). For short term use, maximum temperature should not exceed 925°C (1,697°F). Typical applications include handling of sensitive and electronic components, soft materials, micro-mechanical parts, glass, quartz, ceramics and silicon wafers. The tweezers body is made from non-magnetic stainless steel. ESD safe.